Hailing from London, England, the four-piece instrumental group known as From the Sky hit the scene with a running start in December of last year. 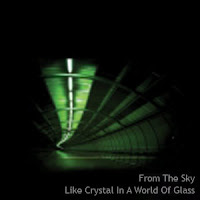 Their first full album, Like Crystal in a World of Glass, although clocking in at just over 30 minutes, is a captivating listening experience packed with energy and emotion. Following closely in the vein of traditional post-rock acts such as Explosions in the Sky, the band uses all of the classic elements of the genre, skillfully delivering tranquil atmospheres, intense climaxes, and soothing melodies that grace each of the album’s five tracks. Some of the most enjoyable qualities of From the Sky’s music are its simplicity and the ease with which listeners can enjoy it. Many modern instrumental groups often delve too deeply in extremes, dragging out basic melodies for far too long and erupting in overwhelming crescendos that can completely kill the mood. The beauty of Like Crystal in a World of Glass, however, is that everything seems just about right. This is certainly no mono-tone album by any means, though. Each segment of music and each mood evoked by it seems to come at just the right time and with just the right amount of effort—a quality marked by true artistic vision and often absent in today’s instrumental scene. Although this album is a fantastic example of subtle, passionate instrumental rock, listeners must also remember to take it for simply what it is and nothing more. Instrumental enthusiasts seeking a cutting-edge, out-of-this-world album of innovation and experimentation might want to skip this album or simply re-adjust their expectations. Point being, From the Sky do not bring anything new to the instrumental, “post-rock” table in this release, and they quite possibly didn’t intend to either. The real value of Like Crystal in a World of Glass can be seen in its modest yet masterful technique which is only truly observable by the ear. The band seems to gather all of the often un-focused methods of those before them and creates something much clearer and much more deliberate. Although created by a relatively unknown group of musicians, this album serves as one of the freshest examples of what instrumental rock music should really be like—soothing, uplifting, and above all, thought-provoking.